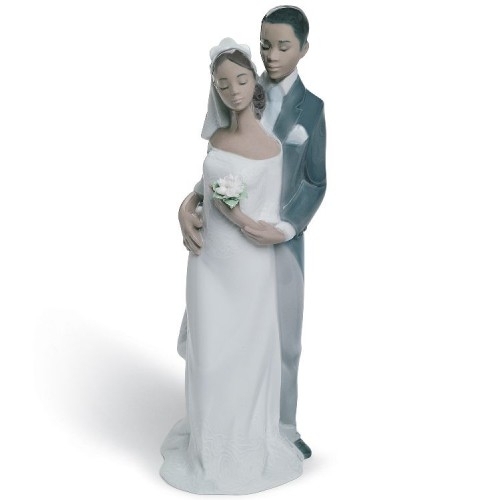 Lladro Wedding Figurines, Forever Yours. A young African-American bride and groom pose for their wedding photo. They are dressed in totally contemporary style with all the traditional details updated. The groom is wearing a dark morning coat with a light-colored tie, and a white flower in his lapel. The bride is wearing a lace veil and an off-the-shoulder scoop neck dress fitted to enhance her graceful figure. A bunch of white porcelain flowers with a green leaves wrapping them depict the bride's bouquet. The affectionate pose, with their hands entwined, transmits the promise of eternal love.